Cabin Fever can set in this time of year. Winter is dragging on and keeping us all inside. The kids are climbing the walls and the moms are pulling out their hair. Whether you homeschool or not, cabin fever is real and affects moms and kids. Here are some cabin fever cures you might want to try to keep your sanity until spring finally gets here. If you homeschool, this could mean starting a new class or a new unit study. A friend of mine does a “theme of the week” during this time of year, just to add some variety and fun. Good sources for short unit studies are NaturExplorers unit studies and CurrClick. I love them because they are downloadable for instant access when you really need them! You can do a winter nature study like Animals In Winter or Snowflake Science. Your something new could be to take up a new hobby or renew an old one. Take a class or search for you tube videos to learn how to get started. New usually means exciting and exciting is just what this time of year needs. This is sometimes easier said than done. If you are fortunate enough to have some extra funds set aside for a quick getaway, consider just a few days were it’s warm. Make an educational field trip out of it. Or just spend the night in a local hotel with a warm pool. Just that can do wonders. Last week, we took a day trip to Shedd Aquarium in Chicago. It was 2 1/2 hours one way and totally worth it. We just needed to get out of the house. Go outside anyway. Hiking is great in the winter. The trees and hills keep the wind at bay and the activity keeps you warm. Build snowmen and snow forts. Have friendly snowball fights. If it is just too cold outside to be enjoyable, take advantage of local open gym or pool times with your family. You could, also, set up a “gym” in your house with your kids’ help. Have stations that you can all rotate through. Think jump rope, hula-hoop, sit-ups, push-ups. It’s more fun when you do it as a family. Last week’s field trip to Shedd Aquarium was so good for us. Not only did we get out of the house, we had a great time as a family, it was educational, and it took our minds off the brutal cold we’ve been experiencing this winter. There are plenty of local field trip sites we can visit that are closer to home this time of year that will get us out, too. There are museums large and small, art galleries, libraries, art studios, and more. What local field trips can you take this winter? If you are going to be trapped inside homeschooling, you might as well have fun, right? We add lots of games to our homeschool winter days. Yahtzee is one of my son’d favorite games and I’m convinced it is why he is so good at multiplication. The word game Quiddler is a family favorite that is great for all ages. A friend introduced us to Scrambled States of America a couple years ago. The kids love that game! My kids love it when we sit the textbooks aside and set up experiments. Doing science is much more fun than reading about it! 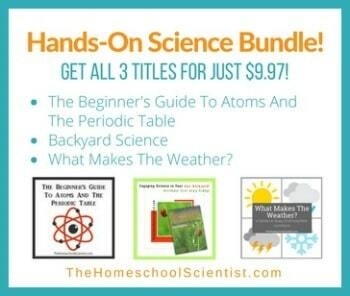 Here are a few science experiments and activities that are perfect for a cold winter day. How do you cure cabin fever at your house? Find out how others are Surviving The Winter Blahs at iHomeshcool Network.